Saturday afternoon, Junkyard Blues co-owner Dina Petty had a longing to see all the Junkyard Blues Dreamgirls, and she called for a reunion of the girls during the Miss Luci Show on Saturday night. There really wasn’t enough time to plan any elaborate music associated with the Dreamgirls, but I think we all realized that this reunion was more about just being there. And as the evening moved into the night, the Dreamgirls were there in force. The REAL Junkyard Dreamgirls have been around since 2007 and I was proud to be inducted into the sorority in 2008. Even with members leaving SL and new members being inducted, there seems to an average of eighty girls in the group most of the time. And over the years we’ve been involved in numerous activities that support the Junkyard, plus we have an Dreamgirl group chat (I think of it as the Dreamgirl Network) for sharing the latest news. But more than anything, I beleive there are always Dreamgirls ready to come running to answer the call when someone needs help or there is an event, and that’s how it was last night. I’m not sure what the final count was, but I’m gonna guess that almost half of the Dreamgirls answered Dina’s call during the evening, and even some Cabana Boys we haven’t seen in ages showed up for the reunion. Even tho the runion was planned for 7pm, Dreamgirls began arriving as Miss Luci (a Dreamgirl herself) opened her Saturday Night show. Our Saturday night crowd averages over 40 on most night, but last night we averaged over 60 peeps all night and approached 70 at one point. It was fun to see so many Dreamgirls all in one place. Happy Reunion Girlfriends. 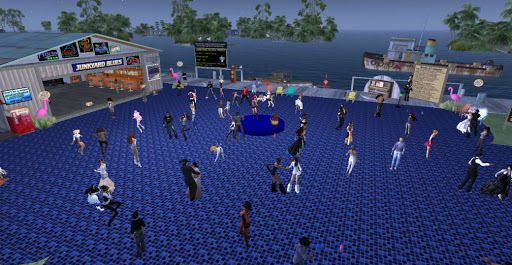 Btw, since the changes to the Junkyard dance floor (the combination of JY and JY south sims), I’ve noticed that our crowds have gotten bigger and bigger. Also, complaints about lag are much less, even from people with underpowered computers. This entry was posted in Events and tagged Events, Friendships, Parties, Second Life. Bookmark the permalink.